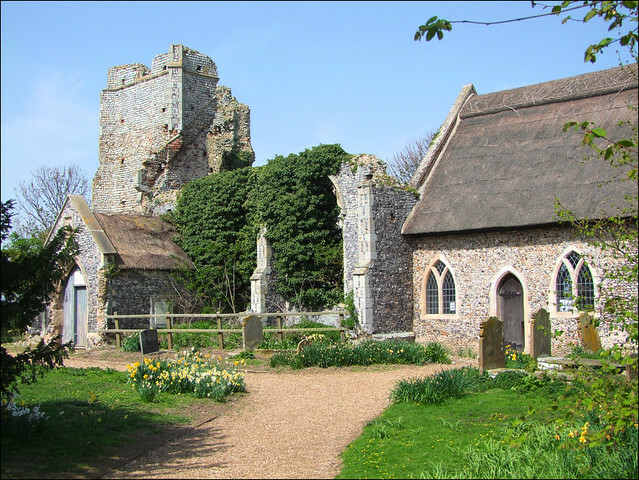 Billockby church is a landmark, alone on a rise to the east of the Acle to Stalham road. There is no other building near. You reach it along tiny lanes cut deep between rolling fields, but in fact these lanes run into busy roads, and Billockby church's isolation is something of an illusion. Nevertheless, it is an easy one to maintain if you stand in the tree-surrounded churchyard, the fields rolling away in all directions, without another human being in sight. This must have been a fine church once, but the tower was rent asunder by a lightning strike in 1762. Judging by the crack the event must have been spectacular - I hope nobody was inside it at the time. As so often happens, falling masonry destroyed the nave, and all that was left was the chancel. However, as discussed in the introduction, this proved sufficient to the needs of the congregation, who made it safe, huddled in it miserably until a full-scale restoration of 1872, and left the rest a picturesque ruin. And so it remains. The thatched chancel is cottage-like, and seemed especially so on a sunny spring day in 2011, with the churchyard full of flowers coming into bloom. One survival of the collapse was the south porch, which now stands alone against the ruin of the south nave wall. There is some interesting 17th Century graffiti on the eastern jamb of the south doorway; Henry Mann and William Tooley came to visit from neighbouring Clippesby in May 1671, and made sure that future generations would know about it. Perhaps there wasn't a visitors book in those days. Not that Billockby church needs a visitors book, for I have to tell you that All Saints is pretty much the only church in the entire Broads area which is kept locked without a keyholder notice. Many must be the pilgrims and passing strangers who make their way up here, but there is no Christian welcome within the gate, I am afraid. So I cannot tell you what the chancel is like inside. However, it is a simple matter to climb over the fence on the north side of the building and into the former nave, where you can stand for a moment and imagine yourself back into the late medieval heyday of the building, before the chancel arch was bricked up and when the devotions of the English Catholic Church rang out within these walls. And you can turn and look up at that great gap-toothed tower, and imagine what it must have been like to watch it fall.